The author’s own words in the front of her latest children’s book give you a clear idea of what is ahead. A little didactic perhaps, but there is no mistaking the strong intention of Cornelia Funke to rally the troops to stand up for animals and the environment at all costs. She uses her strong interest in fantasy as the vehicle for her message, but it is her message that carries the day. 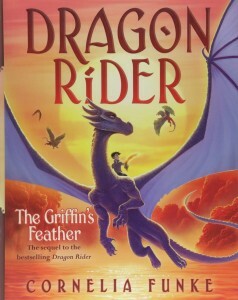 The book is a sequel to Dragon Rider, and gives back story here and there. It is not really essential to have read the first book, but if you have, it makes it more rewarding. This children’s book has a relentless pace of drama, difficulties, fantasy characters, and life-and-death situations. It is a sophisticated book that takes concentration to read. At some point it goes back and forth between two situations, one at ‘home’ and the other on the quest. So this children’s book requires good reading skills and the willingness to read with focus and depth. At the same time, this is the reason the book is both engrossing and educational. Personally, I find it difficult to read a fantasy children’s book, when many words, names, figures, characters, places, are all out of the ordinary realm I live in. To her credit, Cornelia Funke recognizes this and a very long glossary of places and characters is included in the back of the book. Any fan of Cornelia Funke’s other children’s books will surely enjoy this. Prepare yourself for a wild ride, a wild Dragon Ride at that!